The Milwaukee County Zoo takes great pride in its animal collection. More than 3,000 animals representing 424 species reside at the Zoo, and our zookeeper staff devotes hundreds of thousands of hours each year to these residents, making sure they are healthy and content. Keepers also serve as ambassadors for the animals, educating visitors about conservation and zoology. 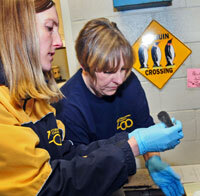 What better time to recognize the diligent and dedicated work of zookeepers than during National Zookeeper Week, July 21 – 27, 2013. 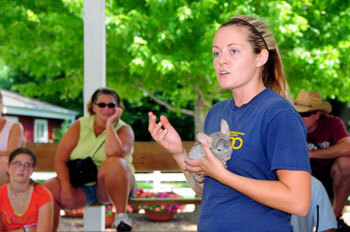 Currently, there are an estimated 6,000 animal care professionals in the United States. To highlight the wonderful work that the Milwaukee County Zoo animal care staff does every day of the year, the Zoo will host a special fundraiser called “Keeper on Display,” July 21 through 27 from 9 a.m. to 5 p.m. daily. This unique event will allow several keepers to actually reside in the Zoo’s vacant indoor cheetah exhibit in the Florence Mila Borchert Big Cat Country. Several keepers will rotate shifts daily (keepers are volunteering their time) to draw attention to the many facets of zookeeper duties, performed on a daily basis. The public is welcome to donate funds at the exhibit, all of which benefit the Center of Conservation Biology at the University of Washington. This organization takes part in a multitude of research worldwide, such as DNA testing of confiscated ivory to help in prosecuting poachers and traders dealing in illegal trade. The Milwaukee County Zoo activities for National Zookeeper Week are coordinated by the Milwaukee chapter of the American Association of Zookeepers. The local chapter currently has 15 active members. Please join our Zoo in thanking zookeepers throughout the country and worldwide during this special week, for all that they do for animal welfare and conservation. We encourage guests to visit the Zoo to support these dedicated professionals as they continue to work to save imperiled species around the globe. For more information on National Zookeeper activities at the Milwaukee County Zoo, please contact the Zoo’s Public Affairs and Services Division at 414.256.5411.